I am sure most of you want to look beautiful and have flawless skin throughout life. Aging takes a toll not only on the body but also on the skin. Especially for ladies who are nearing their Menopause, the skin feels dry, dull, develop acne, fine lines, wrinkles, and dark spots. When you are young you don’t have skin issues, it is only when you start aging that the skin develops certain problems due to changes in hormonal levels in the body. What you can do is worry less and find out a proper solution which will last long. I always thought who is beautiful, a person who is just beautiful from outside or a person who is beautiful from inside. A person who is beautiful from outside may not be the same inside, but a person who is graceful from inside has an external beauty which is untouched. The whole world runs after external beauty which fades with time but when we love someone's inner beauty then it lasts for a lifetime. There are few questions flashing in my mind before i begin writing. What is Self image ? And how its shapes our future ? 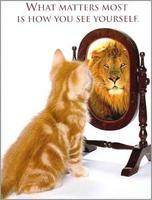 Self image is the the way we perceive ourselves. The work or activities we do is the reflection of our self. The words which we speak, the way we walk, talk, eat, treat others or live our life everything defines us. Its your real image which you cannot conceal from the whole world, its something which is visible. We might act as an impostor at times but our real image is displayed and it cannot be hidden.